THE HOBBIT: THE BATTLE OF THE FIVE ARMIES is my clear favorite of the (bleeping Balrogs, I can't believe they made it a) trilogy. Clocking in at just under the 150-minute mark, the final entry in director Peter Jackson’s trilogy adapting J.R.R. Tolkien's The Hobbit is the shortest of the three - a fact that would be wholly meaningless if it weren’t also the most focused. Taking it’s first 15 minutes to breezily wrap up the dragon rampage that cliffhung the prior film, FIVE ARMIES jumps right into its titular conflict - a massive confrontation between men, dwarves, elves and orcs that resolves THE HOBBIT while acting as a flashpoint for the coming Ring War that will be at the center of THE LORD OF THE RINGS. The feuding gets kickin’ when power-mad dwarf leader Thorin Oakenshield (Richard Armitage) seals the gates of the treasure-packed and newly dragon-free fortress Erebor to search for the fabled Arkenstone, which hobbit and fledgling burglar Bilbo Baggins (Martin Freeman) secretly pocketed in the previous film. Things get ugly when Bard the Bowman (Luke Evans), saviour of the dragon-sieged human settlement Laketown, and elf lord Thranduil (Lee Pace) both show up at Erebor seeking treasures owed to their respective people. Meanwhile, perpetual bonnet-bee Azog and his orc army prepare to march on Erebor and take the Lonely Mountain for the resurrected Dark Lord Sauron (voiced by Benedict Cumberbatch). Jackson’s Middle Earth films have been praised and skewered in equal measure for their ability to parcel out compressed moments of satisfying character development amid minutes and miles of often elaborate, occasionally empty battle choreography. 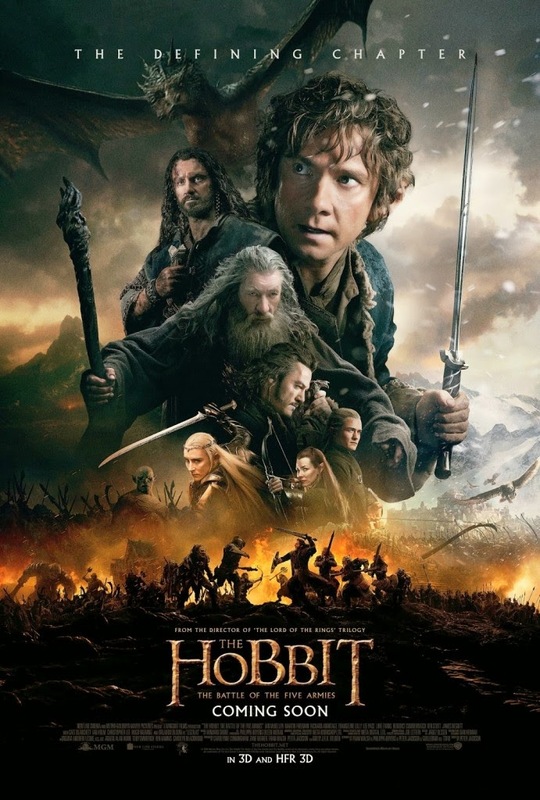 With nearly two-thirds of its runtime devoted to its massive, titular confrontation, FIVE ARMIES may be Jackson’s most entertaining balancing act between action and story, even if, by virtue of THE HOBBIT’s one book to three film ratio, those stories lack some of the gravitas and scope of those delivered in the three to three THE LORD OF THE RINGS. On the battle side, the usual attention is paid to the the weaponry and maneuvering of the different races, from the lithe precision of the spear-wielding elven platoons to the squat, blunt lumber of the hammer- and axe-swinging dwarvish battalions. It’s a joy to watch, but not half as fun as some of the orc, troll and miscellaneous monster design, on which Jackson and his team at Weta have totally outdone themselves (though without making anything as fascinatingly grotesque as the first film’s Goblin King). With Sauron just returned to a pre-Uruk-Hai Third Age, I guess the orc armies kinda have to enlist what they can get. Giant legless troll with makeshift tree-feet rammed up his torso? You’re in. Derpy monster man with one proportionate arm and one T-Rexish baby arm? Accepted. Ancient race of Graboid-lookin’ super worms? Go forth! On the character side, Jackson’s HOBBIT films were already interesting for the alterations the writer/director and his co-writers Philippa Boyens, Guillermo del Toro and Fran Walsh, made in order to give an almost purely episodic pseudo-picaresque the narrative stakes to warrant a three-film telling. Two of these - Azog the white orc’s dogged pursuit of the protagonists and the love triangle between Thorin’s nephew Kili (Aiden Turner), elf prince Legolas (Orlando Bloom) and elf warrior Tauriel (Evangeline Lilly) - struck me as non-starters in the two prior films. Azog seemed like a hollow writing device to simultaneously make up for the lack of an ever-present villain while offering the opportunity of more and longer fight scenes, while the moony-eyed elf/dwarf stuff felt like a cheap way to shoehorn in some easy emotional resonance a la the elf/human love stuff between Aragorn and Arwen in THE LORD OF THE RINGS. Maybe it’s because I knew both stories would finally come to some sort of resolution, or maybe it’s because their presence was no longer delaying upcoming from-the-book scenes I was actually interested in seeing, but I thought FIVE ARMIES handled both arcs nicely. Thorin’s inevitable final confrontation with Azog was particularly satisfying for a storyline I really couldn’t have cared less about going in. Aside from a series of kid-targeted comic foils from uni-browed, yellow-bellied Lakeman Alfrid (Ryan Gage), the other major connecting narrative thread - and the ultimate crux of the five army fight - is the awesome THE LORD OF THE RINGS Issue Zero elements that Jackson brings into the mix. See, while Thorin sweats out gem fever in Elebor, on the other side of town, elves Galadriel (Cate Blanchett) and Elrond (Hugo Weaving) have met up with wizards Radagast (Sylvestor McCoy) and Saruman (Christopher Lee) to rescue Gandalf (Ian McKellen) from imprisonment in Dul Guldur, where they are attacked by the Nazgul wraiths. Probably needless to say, the film is also pure latter day Peter Jackson, with all the visual over-indulgence, theme belaboring and forced grandiosity that the very mention of the director’s name has come to imply.